Raise your hand if you are ready for a pop of color! If you're like us and can't wait to dig in the dirt, we've listed below some of our favorite cold hardy flowers and crops that you can plant early spring. The weather in Oklahoma City is now warm enough to plant early spring flowers - yay! (OKC falls into Zone 7a on the USDA Plant Hardiness Map.) Our favorite cold tolerant flowers are snapdragons, lobularia (commonly referred to as alyssum) and petunias. These flowers are all in the above picture - the snapdragons are in the back, the alyssum on the left and the petunias on the right. These pretties are not as cold hardy as pansies but they can tolerate a light freeze. Kansas City is quite a bit colder than Oklahoma City (USDA Plant Hardiness Zone 5b), so we are sorry to report it will be a few weeks until you are able to dig in the dirt. When it is warm enough, you will be able to plant hellebores, snapdragons, pansies, violas and ornamental cabbage. As far as cold weather crops go, your options are cilantro, lettuces, dill, spinach, strawberries, kale and broccoli. These can all be easily planted in a container and you could even put several into one pot. It's go time in OKC to plant these crops but still too early in KC. If you are ever in doubt as far as selecting plants and when to plant them, we highly recommend chatting up the knowledgeable people who work at your local garden center. They can tell you when it is time to plant without risk of a freeze. Our favorite garden centers in OKC are TLC and Precure and in KC our faves are Family Tree Nursery and Suburban Lawn & Garden. Julie and I are both obsessed with these gardening tools. The Hori Hori garden knife and potting scoop. The knife can cut through the toughest roots in an outdoor pot without any problem. Its serrated edges also can open bags of mulch or soil if you don't have scissors handy. We love the potting scoop because you can add new soil quickly to a planter since the scoop is so large and moves so much dirt. Do yourself a favor and buy these for the spring planting season. You won't be sorry! Who's ready for COLOR in outdoor planters?!?! Let's talk color! Filling an empty container is like an artist with a blank palette. Lots of opportunity for creativity and making it fit your space and personality. We absolutely love using lots of different colors in the container gardens we create and we don’t mean the colors on the flowers. We're talking about the leaves on the plants themselves. Plants fall into these color categories: chartreuse, purple, silvery blue and green. It's sometimes a challenge, but we try to mix at least three of these colors into one container. Take a look at the picture above and you’ll see the silvery blue dusty miller, chartreuse moneywort and kelly green angelonia and pentas. Also, adding one plant with a variegated leaf adds fabulous interest. Do give some thought to the color of your actual container when you are selecting the colors of your plants. 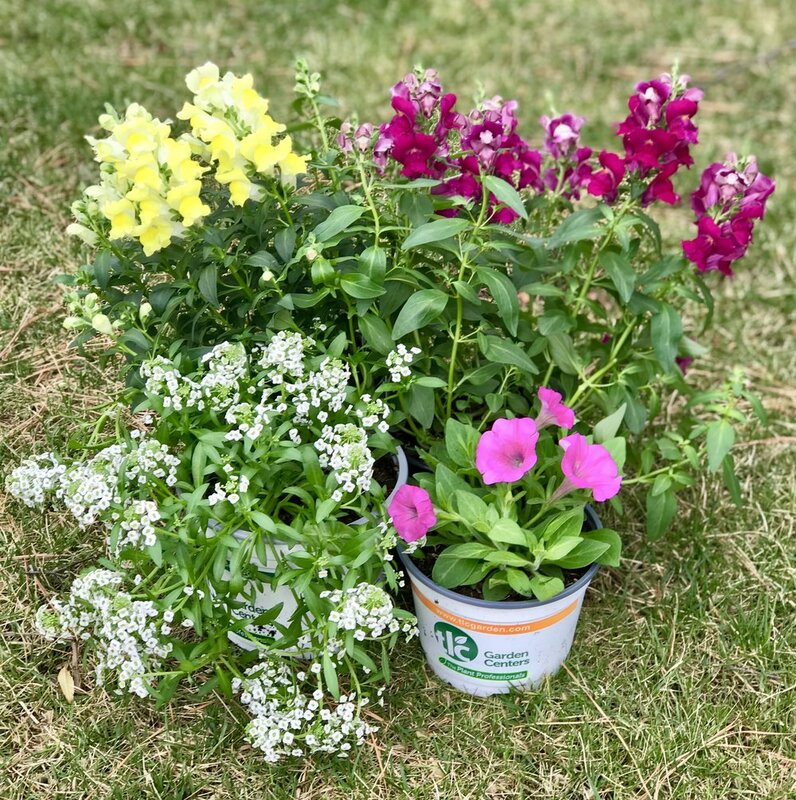 If you have a light colored container, you may consider a dark spiller (like purple sweet potato vine) and if you have a dark colored container, you may want to go with a lighter spiller color that will pop (like chartreuse sweet potato vine or moneywort). Same goes for the background to the container, which is typically the color of the house or business. If it is a dark background, I would suggest using a bright thriller plant that will show up against the dark and vice versa, if you have a light colored background, you may want to use a dark thriller plant so you can see it from the street and it doesn't blend into the wall behind it. Do you love pretty planters but don't have time to do it yourself? Spring is just around the corner friends! Let Adorn plant seasonal flowers and plants in your outdoor pots and cross that task off your list. Whether it's for your front porch or store front, we'd love to help. Also, an Adorn gift certificate makes a perfect gift for Mother's Day! Make sure to follow Adorn on social media to get the most up to date scoop. Click the links below if you'd like to follow us on Facebook, Instagram and Pinterest. We were thrilled when the owners of Chris' Express Drug asked us to help with container gardens. The pharmacy opened in 2013 and moved to a beautiful new building in December, 2018. They wanted new planters so we visited the pharmacy while it was still under construction and considered the scale and style of the building. We sourced two outdoor planters that blend in perfectly to the space. One of the owners, Lindsey Burns, shared this with us and we couldn't agree more. "We hired Adorn because we love the curb appeal our pots add to the front of our business. Adorn makes it easy by taking care of changing out our pots each season." Older PostTHE DIRT - Let's get ready for the spring planting season!